With compliance regulations such as CRF 60.741.44 (J), Section 503 of the Rehabilitation Act of 1973, reaching and recruiting people with disabilities is a must in today’s business world. But many recruiters do not have the disability knowledge or background to do so effectively. For others, the interviewing process can be an awkward experience at best. Knowing what questions to ask and, more importantly, how to ask them is vital to discovering qualified candidates, especially when interviewing those with disabilities. Possessing the right knowledge can help your organization hire qualified candidates with disabilities, as well as creating a positive environment and more inclusive workplace. 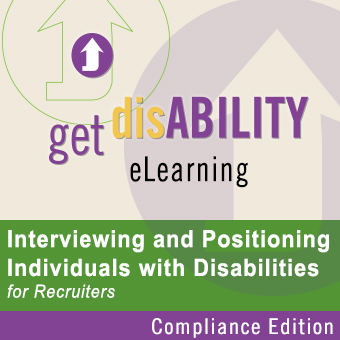 In this 45-minute eLearning, self-paced course, recruiters and HR support staff will gain a solid foundation for the successful interviewing and positioning of individuals with disabilities. Your talent acquisition team will increase their knowledge and expertise of: their role in OFCCP and disability regulations, disability etiquette, interviewing techniques and questions for those with disabilities, forms of hidden disabilities, disclosure and requests for accommodations, positioning a candidate with an obvious disability, building a sustainable, more inclusive culture, decreasing employment liability exposure, and more. Increase the level of expertise for everyone on your recruiting and HR teams today and expand your talent pool. Length of the course: 45 minute session. This introductory module is appropriate for all members of your recruiting and talent acquisition teams. The module is interactive and provides a solid foundation for successfully interviewing individuals with disabilities. Objective: Preparing your recruiting team to easily navigate and gain a comfort level meeting and interviewing applicants with a variety of disabilities. Creating a comfortable environment for all.